During your vacation to Pawleys Island, you will enjoy a wealth of fantastic dining options around the area! No matter if your idea of a perfect meal is Mahi Mahi, a bacon cheeseburger, rack of lamb or anything in between, the dozens of world-class restaurants dotting the Pawleys Island area will delight your taste buds and ensure your appetite is completely satisfied. And with the Tastes at Pawleys culinary festival, now you can sample the area's top restaurants in one sitting! Celebrating its 10th year in 2018, the Tastes at Pawleys event takes place on April 29th at the Precious Blood of Christ Church in Pawleys Island. This annual gathering of the area's top restaurants and chefs has wowed attendees with the impressive array of delectable dishes and treats available to enjoy. This year's festival will continue that tradition with 18 area restaurants expected to take part. Coastal Dish, the on-site restaurant of Litchfield Beach and Golf Resort, will be taking part for the first time. Since opening, Coastal Dish has dazzled diners with unique southern spins on classic dishes like their B.L.T.A. sandwich stacked with peppered bacon, fried green tomatoes, avocado and pimento cheese or their lowcountry fish and grits, featuring cornmeal-encrusted local flounder and Adluh grits with bacon and tomato jam. The Tastes at Pawleys culinary festival will take place from 4 PM to 7 PM. Admission tickets to the event are $5 at the door and tasting tickets are $1 each. In addition to the food samples, beer and wine will be available from Better Brands and Pawleys Wine and Spirits, and from 5 PM to 7 PM the Paul Grimshaw Band will entertain with live music out on the lawn. All proceeds from Tastes at Pawleys will go towards Father Pat's Lunch Kitchen, which provides over 300 meals weekly to those in need in the Pawleys area. What's that? You haven't booked your spring Pawleys Island vacation yet? 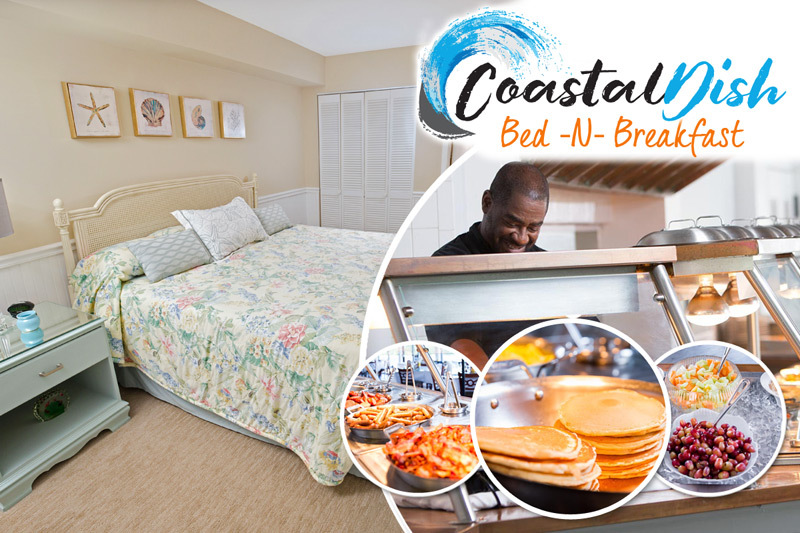 With great deals like our Spring Into Savings special you can book a first-class Pawleys Island condo at up to 30% off and receive two free breakfast vouchers for Coastal Dish during your stay! Our Pawleys Island vacation rentals at Litchfield Beach and Golf Resort, Pawleys Plantation Resort or True Blue Resort will exceed your expectations and make your next trip your best one yet. The remaining spring weekends are booking fast so reserve accommodations for your upcoming trip to Pawleys Island today!